Today’s Guest Blogger – Ellen Smith from Columbus OH may sometimes have difficulty convincing folks that her red Gordon Setter is in fact a Gordon and not an Irish, but she and Jura had absolutely no trouble convincing judges to award him the three Qualifying scores he needed to become the first Gordon Setter to earn a Barn Hunt title! Thank you so very much for sharing your story with us Ellen! Much more information about the sport will be found on the website Barn Hunt Association LLC . In order to compete to earn titles you must first register on the website to obtain a Barn Hunt registration number before entering any trials. The dogs and I did some practice sessions at our dog club to familiarize them with the straw course, tunnels and rats. Most trials are not actually done in a barn. There are five levels of competition and with each level the course and the `requirements become progressively harder. The Instinct level gives the dog a chance to check out the ring and find a rat. You can enter Instinct and Novice at the same trial so it’s a good warm up. The dog must run naked (no collar) in the Instinct class and the ring is enclosed so dogs can’t escape and only one dog is in there at a time. The rats are in heavy-duty PVC tubes so the dogs can’t injure them but can still smell them. There will be a judge and rat wrangler in the ring. 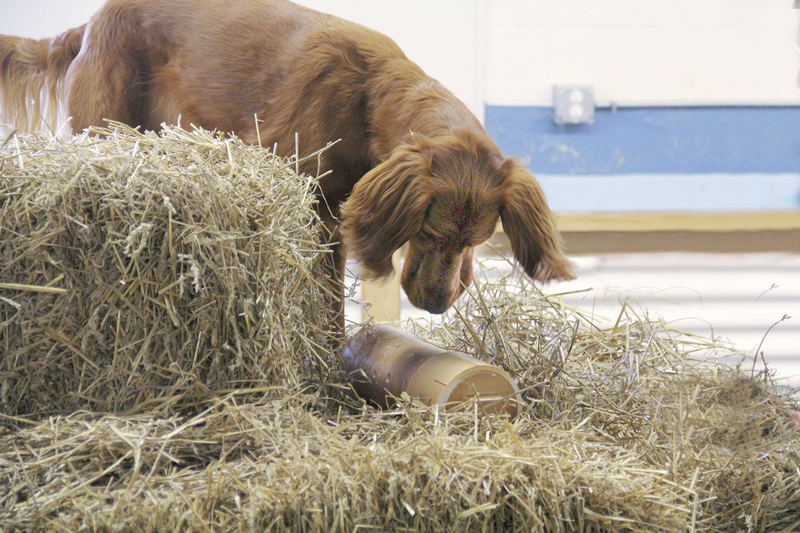 In Novice the dog has two minutes to find a rat tube, run through a tunnel and climb onto a straw bale. There are also empty tubes and rat bedding/dropping tubes hidden to fool the dogs. The tubes maybe hidden up high or low and after every five dogs the tubes are hidden in new spots. You and your dog are held in a staging area out of site of the ring with four other handlers and their dogs so the handlers can’t see where the tubes are placed. Exhibitors are called from the staging area one at time to go to the ring for your turn to compete. When you enter the ring there is a marked area called a start box where you stand with your dog. When the Judge says GO you remove the collar and leash and send your dog on his hunt. Each dog has their own way of indicating when they have found a rat, so doing practice sessions before you compete will help you know how your dog indicates a find. For example I have one dog that points and one that claws at the straw when they’ve found a rat. When you see that your dog is indicating a find you must say RAT in order for the judge to give the final nod as to whether the find is a yes or no. If it’s an empty tube or bedding then it’s “No” and “Thank you for your entry fee, you didn’t qualify but we sure had fun”. After your dog completes the three qualifying hunts in Novice he earns his RATN title and can move on to the next level which is Open where they must find two rats in 2 min. 30 seconds to earn RATO. In Senior there are four rats hidden and the dog has 3 min. 30 seconds to find them (RATS), and finally in Master the dog has 4 min. 30 seconds but you won’t know how many rats are hidden (RATM). There may be up to five of them but the judge decides how many and it’s up to the handler to know when his dog has found them all. The Barn Hunt website (you can click this link to go directly there) where it lists all the trial dates, rules, statistics, registration forms and when you complete a title you can print your Title Certificate right from their site. Currently there are five Gordon Setters who’ve earned Instinct titles, four with Novice titles and one with an Open title. It is so much fun for my dogs and an easier sport for me since I don’t have to run with them like in agility or hunting. Dogs of any breed, mix or size can compete. I hope all our Gordon friends get to try it out. Previous PostCounter-Surfing – Gordons do it best without a board!Next PostWhy all the fuss about inbreeding? Wow, I’ve never heard of this before! Looks like fun. I’ve got a very ‘nosy’ boy who would probably really like this. Bev Andersen has promised me that this is the next activity we will be attending, apparently there is a training location out by where I live. We haven’t made it there yet but it’s on our to do list.